The ideal companion for our Winchester Swivel Glider, this masterfully handcrafted ottoman brings whole new dimensions of comfort and relaxation to any lounge chair. 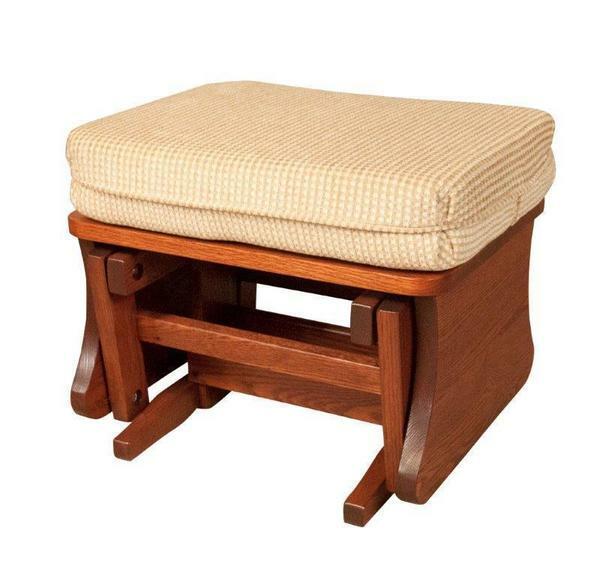 This ottoman offers deep cushioning on top for unparalleled comfort, while its handcrafted solid wood frame and components ensure that the Winchester will continue to offer exactly the same kind of deep relaxation and support for years to come. If you need help choosing wood, stain or upholstery, please don't hesitate to get in touch with one of our Furniture Specialists. Email us at Questions@DutchCrafters.com or call us toll-free at 866-272-6773. We thank you for shopping with DutchCrafters. - Light Distressing - Customers can expect to receive glazing to replicate a rich natural patina, light distressing, slightly eased edges, nicks and extensive pinholes in the furniture. -Heavy Distressing - Our ultimate antique finish. Rub-through of the rich patina are masterfully punctuated with another level of extensive nicks, pin holes, eased edges, simulated cracks and other distressing techniques to bespeak several centuries of robust wear and loving care. I'm very pleased to say that your driver ( Eli ) delivered my furniture in fine shape. Very conscientious man that Eli. Enjoyed conversing with him and his partner. They delivered my order in good time, calling me ahead of time to let us know that they were on their way. The furniture looks great ! and my wife loves it. It was a birthday gift to her . Her birthday is 10/12/. and the furniture was delivered on 10/11. Thanks again . if I can send any buissness your way I certainly will. Yes, we received it and it fits perfectly!